It’s been a busy month of painting. 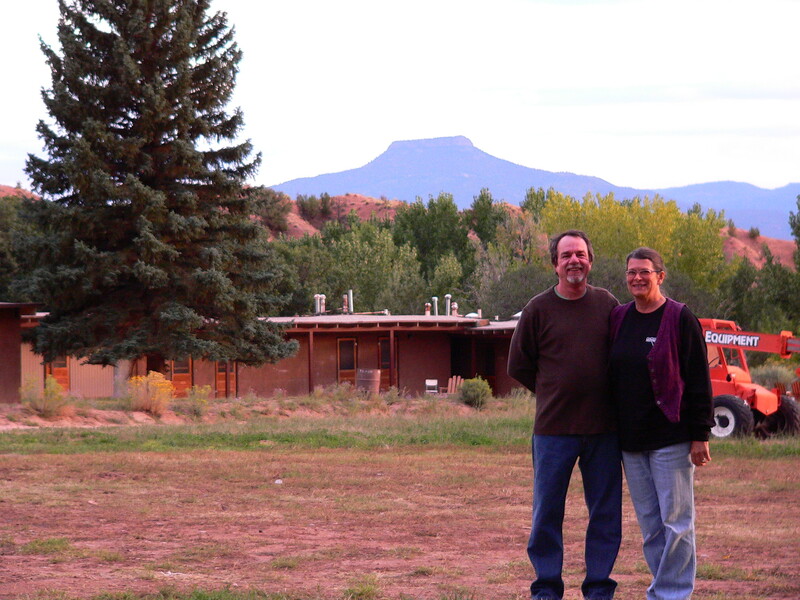 The first week in September I spent the week at Ghost Ranch, in Georgia O’Keefe country…I’ll never forget driving over the hills just before Ghost Ranch and feeling, “I can’t believe it! I’m in the middle of a Georgia O’Keefe painting!” The cliffs, rocks, sky, vegetation in this part of New Mexico is so awesome! The workshop was very well run and taught by Gail and Ken McDaniel. I’ll show you a few pieces that are still in process. 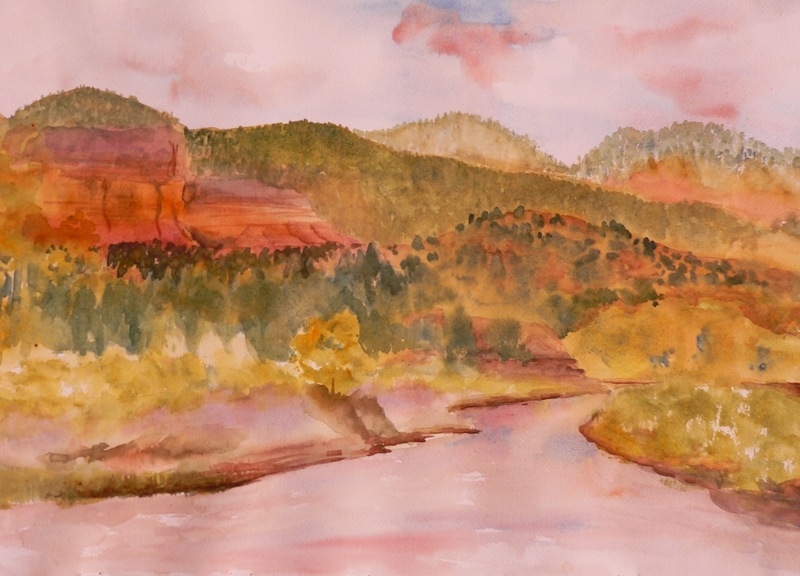 Watercolor painted plen-aire alongside the Chama River, northwest of Ghost Ranch. 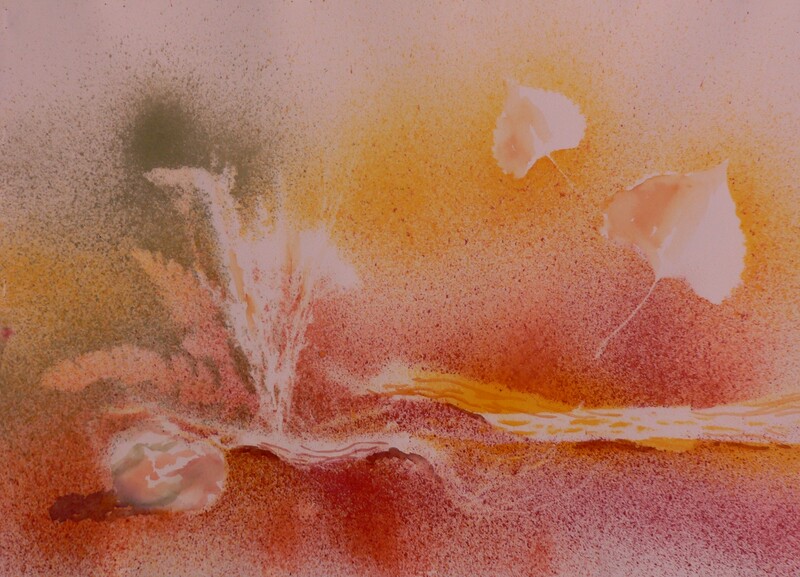 Gail taught several techniques, including one using a tool to spray paint onto the paper. 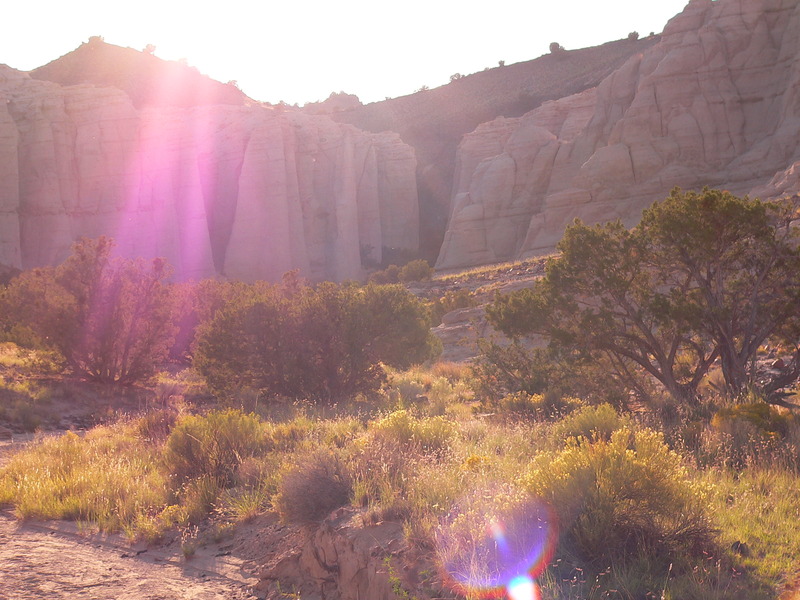 The natural materials, including the cottonwood leaves drifting off, were gathered around Ghost Ranch. One day we walked out into the desert to Georgia’s home (the former home of Arthur Pack)…it was really hot, dry…but the colors were amazing. You may remember the red hills of her paintings, the ochre slides of clay and volcanic rocks sitting out in the middle of nowhere. The beginnings of a painting using found objects and spray on watercolor paint...these are the colors of the desert at Ghost Ranch. The White Place, across the valley from Georgia O’Keefe’s home in Abiqui…my heart expanded as I hiked into the canyon where Ms. O’Keefe no doubt dragged her paints and canvases. The canyon where "The White Place in Shadow" was painted. I helped to teach the portion of the workshop on mandalas. We worked on our mandalas all week long. Most people produced very refined and beautiful mandalas. 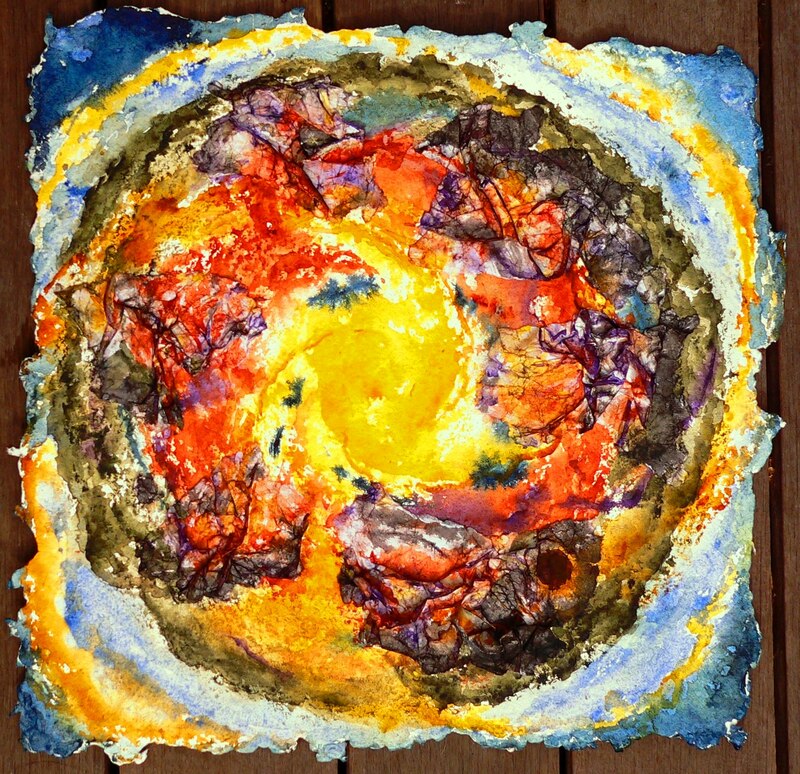 I found myself working with texture (using masa paper and sumi ink) and, again, the desert colors to make a mandala called “Earth in Turmoil”. I tapped into my grief around the deterioration of our beautiful earth (interesting that I should be so aware of that in the midst of the wilderness of New Mexico…) The dark spot you see can be an opening into the depths where we all find healing. My mandala...the earth is my body. It was a profoundly enjoyable week and I brought home rocks, as usual, to remind myself of the connection to the earth which I felt so intensely in this beautiful place. 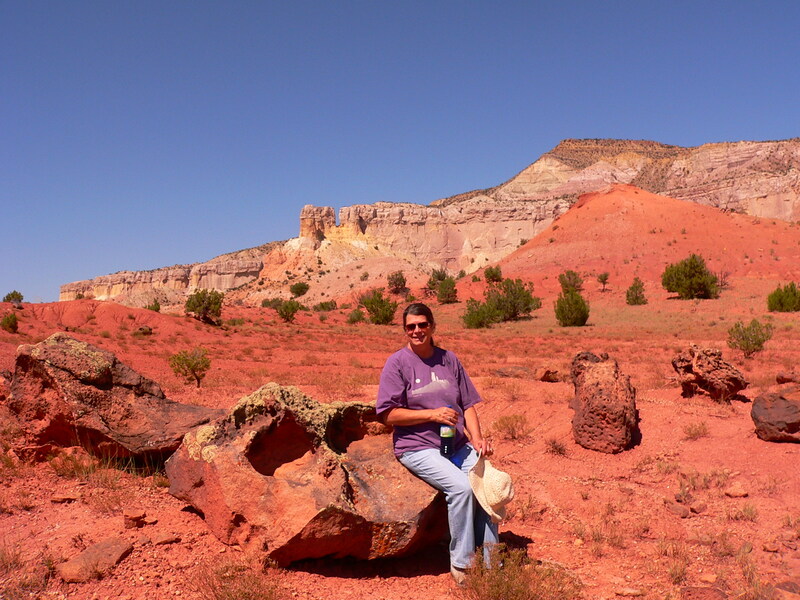 On our hike into the Ghost Ranch desert. Look at that sky! !